I love photos showing four generations of my family. There are quite a few collecting on the blog here, here, here, here, and here. This is another taken two weeks ago at the baptism of my son. 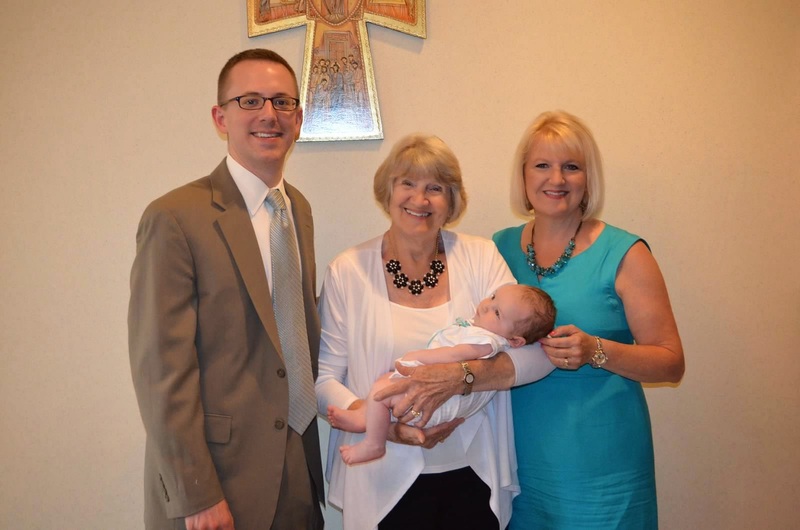 My grandmother Barb Viti is holding her great grandson Brendan Lowry with my mom and me on either side. I will feature Brendan’s baptism in an upcoming blog post. This photo was provided to me by the spouse of a distant relative, specifically a great nephew of my 1st cousin, 3x removed. How’s that for some genealogical reach? This fantastic image was taken around 1920 and shows four generations of Witts. Seated L-R: Joseph C. Roolf, with son Norman Roolf, Mary K. Ostien, Martin Witt, Elizabeth Witt, Lenora C. Witt holding Dorothy (baby). Standing Back Row L-R: John A. Roolf, Margaret M. Ostien Roolf, Johanna Thaner Witt and John A. Witt. 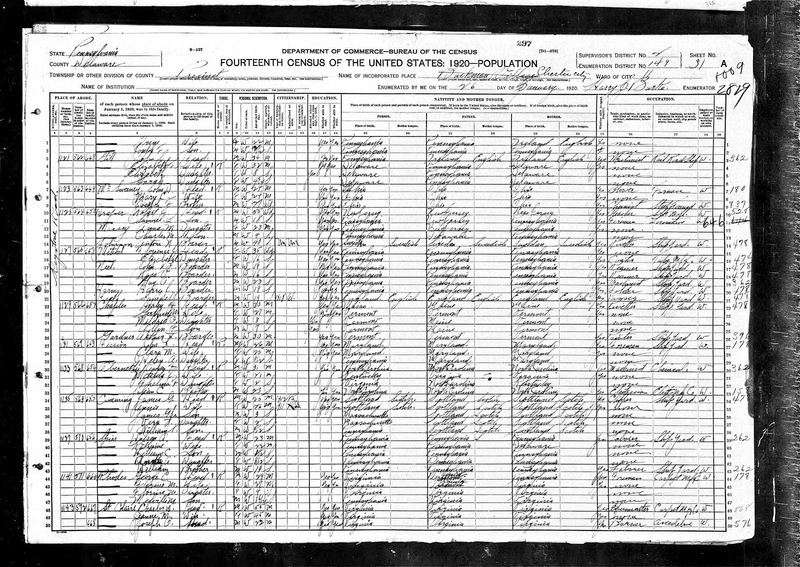 Martin and Elizabeth Kreher Witt are my 3rd great grandparents. Their son John Albert Witt and his wife Johanna Thaner were featured elsewhere on the blog looking into John’s murder. 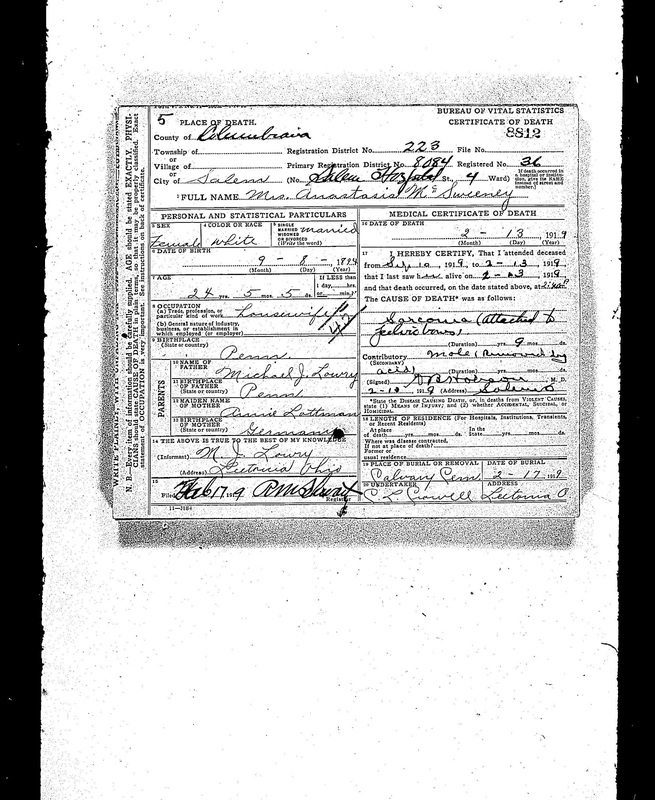 Lenora Clara (alternatively, Clara Lenora) Witt is John’s daughter, married to Joseph Roolf. She is holding her daughter Dorothy while her husband stands with their other child Norman. Joseph Roolf’s parents John and Margaret Ostien Roolf are behind him, while his grandmother Mary Ostien sits next to him. See other Four Generations photos here. I’ve featured a number of photos on the blog that include four generations of relatives. This photo was taken between 1949 and 1962. I can’t be more precise right now because I’m not certain who the baby is, although I imagine this is in the later years of that range based on the suspected age of the individuals in the photo. 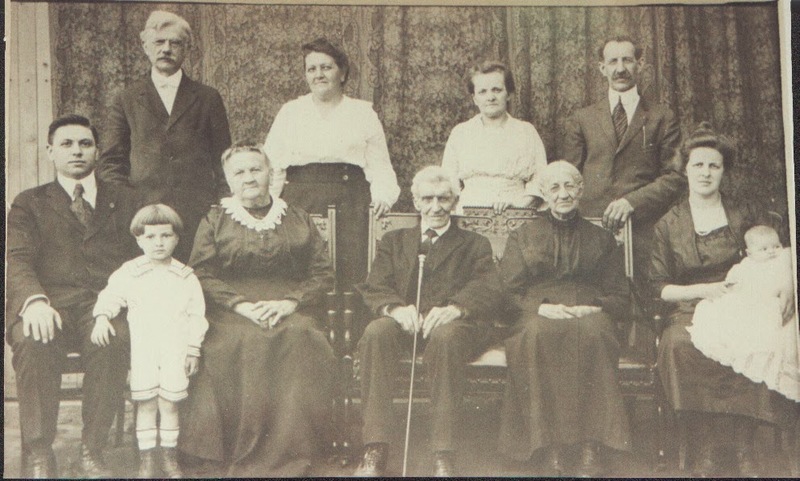 In addition to an unknown aunt or uncle, the photo includes my grandfather Chuck Lowry, great great grandfather George Pepperney, and great grandmother Margaret Pepperney Lowry. I will need to check the original and see if there is any information written on the back. Click to enlarge. Family photo. Family collection. Click to enlarge. 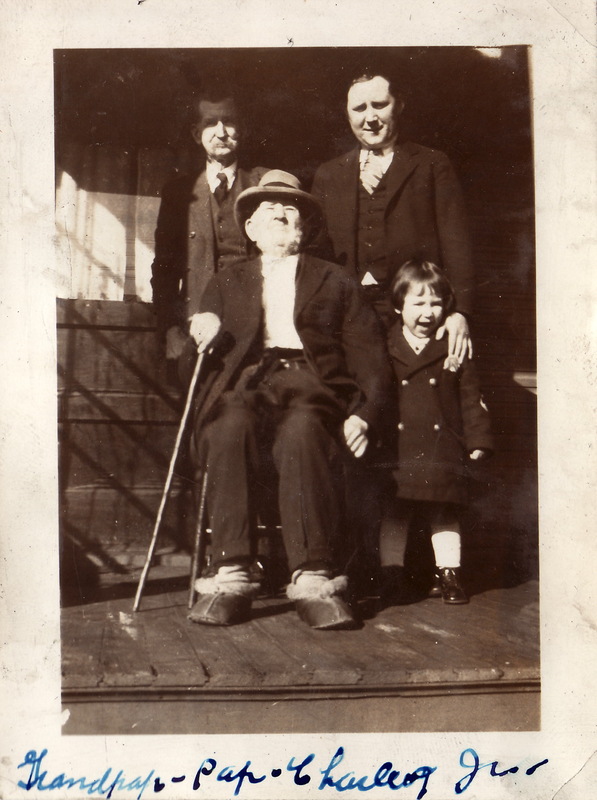 Taken around 1925, this is four generations of Pepperney’s. On the left is my 3rd great grandfather Frank Pepperney, Sr. (1847 – 1927). On the right, my great great grandfather George P. Pepperney (1871 – 1962). 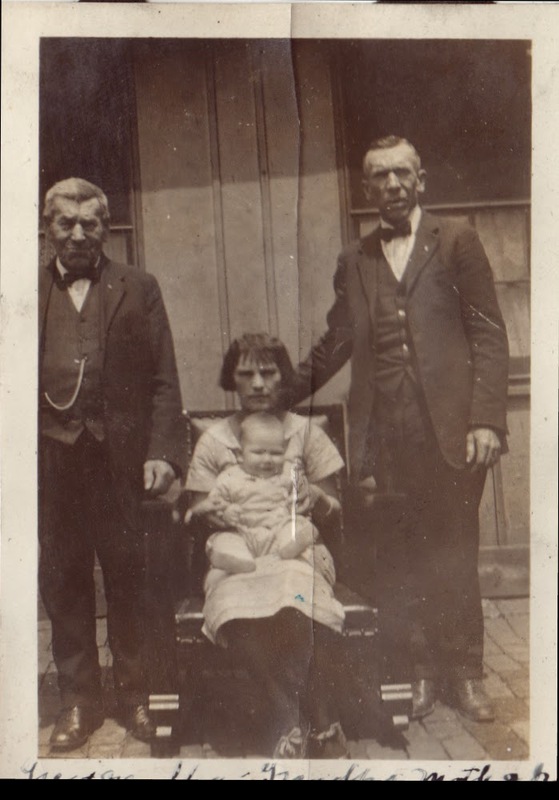 Seated is my great grandmother Mary Margaret Pepperney Lowry (1902 – 1980); she is holding my grandfather, Charles J. Lowry (1924 – 2007). The ‘Four Generations’ photo is something special, perhaps because it is somewhat rare. 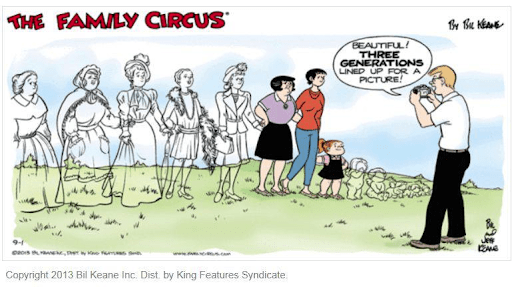 A five generation photo is probably close to impossible, unless the oldest person is close to 100 years old and everyone had kids at a very young age. 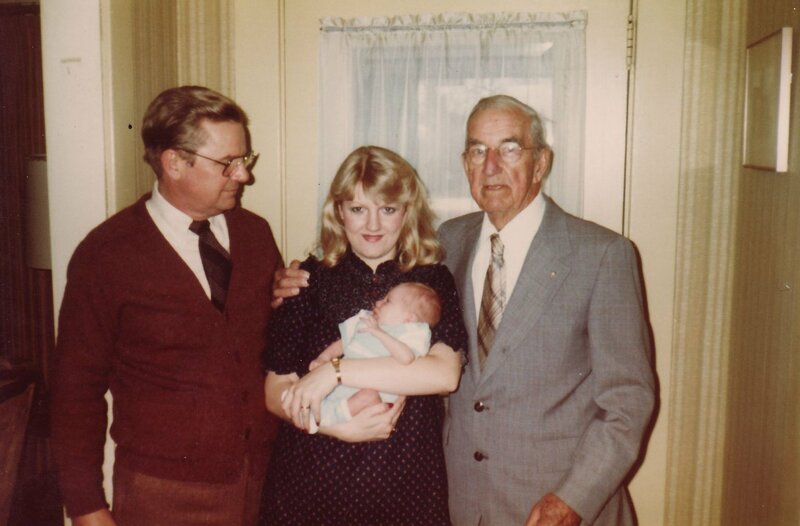 This photo is my grandfather Howard Witt, mother Becky Witt Lowry, great grandfather Francis Witt, and little me around April 1982. Great grandpa Witt lived another 10 years, so I have many memories of him. 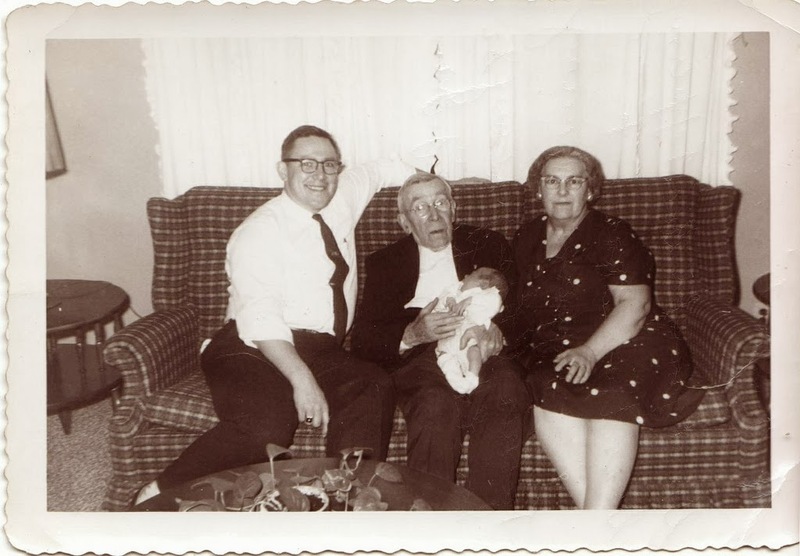 Friday’s Faces of the Past – Grandpap, Pap, Charles and Jr. This photo has recently soared to the top of my list of favorite photos. Four generations of Lowry men in one shot, with a history that date back nearly 185 years. The oldest Lowry, Michael ‘Grandpap’ is about 97 years old when this photo was taken on 12 February 1928. My dad tells me that he was blind and nearly deaf at this point. As he died in June 1928, he would not survive more than a few months after this photo. It’s incredible that a man who spent his life as a coal miner lived long enough to be the oldest in a photo of four generations. Check out his moccasins! My 2nd great grandfather Michael ‘Pap’ was 59 years old. 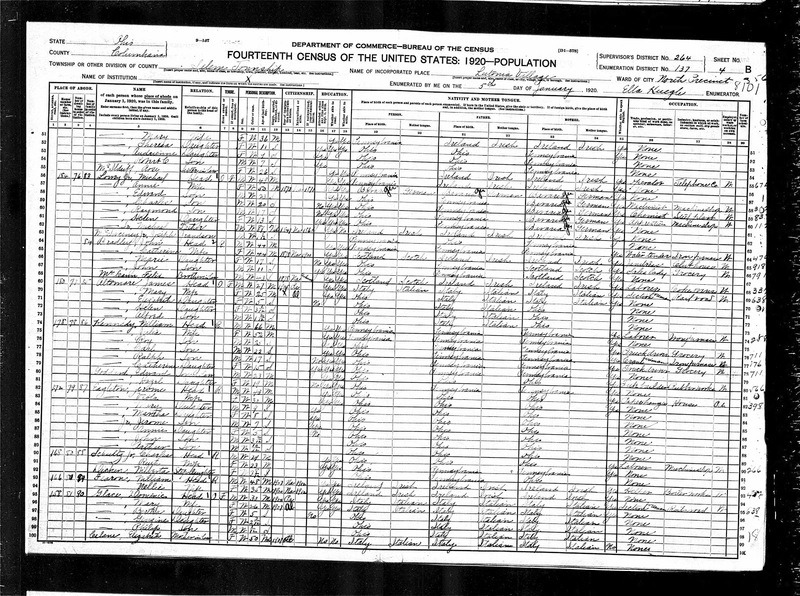 Michael and Bridget Conley Lowry’s youngest son was born in August 1868 in Huntington, Pennsylvania. 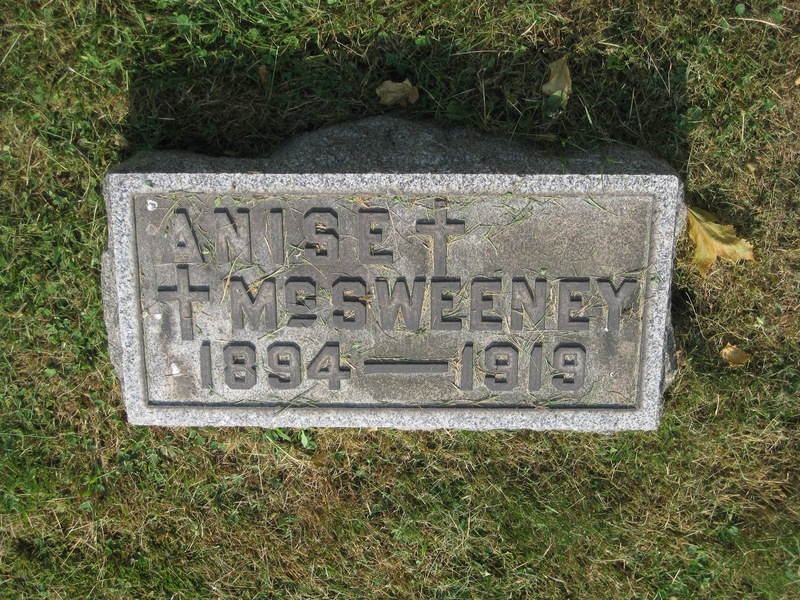 He died in 1949 in Mayhew Nursing Home in Columbiana County. My great grandfather Charles Edward Lowry was born in September 1899. He died in 1975. The little man with the double breasted peacoat is my grandfather Chuck. I never knew him as ‘Junior’ but it’s been great to see more than a few pictures with that caption. My great grandmother Margaret Pepperney Lowry was quite the photobug and was excellent at providing captions. I have a lot of photos from the late 1920’s that I’ve scanned and will be publishing over the next few weeks, but this one is the cream of the crop.